Rockwork may not always be natural. 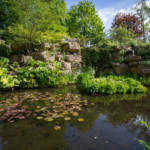 At Waddesdon, much of the most dramatic rockwork is artificial. 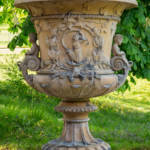 It was made by James Pulham and Son and the gardens are exceptionally rich in this late-19th-century form of landscaping, aimed at creating naturalistic outcrops and grottoes for exotic planting. Soon after purchasing the Waddesdon property in 1874, Baron Ferdinand de Rothschild set out to transform the land around his new manor into the magnificent grounds we see today. 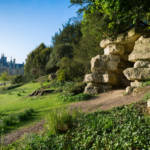 Pulham were already a well-established and highly regarded firm of landscape gardeners, especially skilled in the creation of rock gardens. 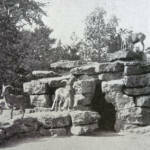 Using mostly natural rock, they also made fake rock by covering rubble and bricks with ‘Pulhamite cement’. Ferdinand’s account books show a first payment of £100 to Pulham as early as 1877. Further payments in the 1880s came to at least £2700, with a peak in 1891 of £1135. Based in Hertfordshire, Pulham built up a network of over 300 clients, across the country. The Prince of Wales, later Edward VII, lead the way in employing them at Sandringham, closely followed by Baron Ferdinand at Waddesdon. The firm closed on the outbreak of World War II, in 1939. You can visit www.pulham.org.uk to find out more.